The Travel Vertical in conversation with Simpleview’s Paul McLeod, Director of Business Intelligence. 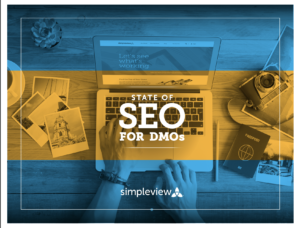 The Travel Vertical: We’ve enjoyed reading “The State of SEO for DMOs Report“ and appreciate your insights into several of the finer points of that document for our readers. A: Numbered lists seem to do well for “things to do” keywords, with or without modifiers such as “best” and “top.” Whether this is because Google directly prefers that format or users like it—and therefore link to it more often—is difficult to say. Anchoring their attractions content with such a list can be politically problematic for DMOs, who want to keep everyone happy without playing favorites. Unfortunately, playing favorites is exactly what users, and therefore Google, want us to do. To the extent it’s possible, curating the best of your destination and listing those high points in a user-friendly, machine-readable manner is the best way to attack this high-volume, mission-central keyword. Q: What is the optimal balance of follow and no-follow links? And why? A: The optimal “balance” will come naturally if you use no-follow tags the way the search engines intend them (e.g. to mark paid or user-generated links as references not created by you purely for editorial reasons). The balance only starts to look off for the search engines if it seems like you’re trying to no-follow all your external links and hoard your ranking power. As long as you’re letting regular external links be followed, you and your DMO should be fine. A: This is still essentially impossible to measure directly, as the SEO benefits of such posts get mixed in with noise from so many other ranking factors. We continue to recommend a healthy social media content strategy as a compliment to SEO, given that so much user sharing and browsing activity occurs on Facebook. A: The Top Stories and Attractions carousels are different. A DMO could optimize the Attractions carousel for its destination by submitting accurate information for points of interest through Google Maps. This may enhance Google users’ ability to explore your destination from Google’s own platform. As of now, however, there is no way to drive traffic to a DMO site from this carousel. All clicks simply take the user to a new Google search using the name of the clicked attraction as a keyword. Getting into the Top Stories carousel would first require the DMO committing to a strong content strategy for generating factual, news-report content. Editorials and features will not help it get into the SERP carousel. Then, this news-only content would need to be published in its own directory on the site, where no non-news articles will be found. This could be accomplished by setting up a separate blog instance for the news articles. With this done, some additional custom background work by a developer would be required; DMOs would need to contact their web vendor about meeting the requirements. Q: In addition to Local Results, Featured Snippets and Twitter pack, are there any other frequently overlooked tips for claiming more free real estate on Google? A: Google Posts are a potentially exciting new way to get into Google’s results, especially when people search your destination name. Make sure you’ve claimed your destination’s official Google Posts slot (city governments and DMOs are both eligible). If the government has already claimed it, ask if they can share access with you. Stories published within Google Posts will appear below the Knowledge Panel served up for your destination. As of yet, the level of user engagement with this section is hard to gauge, but it’s worth at least establishing your claim to the space.